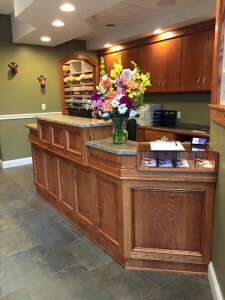 Once you arrive at our Fulton chiropractic office, you will be greeted by name and receive a quick tour of the office. You will then be asked to complete your new patient paperwork. Once all forms are complete you will be escorted by a chiropractic assistant to the examination room. Dr. Titman will meet with you to discuss the specifics of your case. After this, she will determine if chiropractic care seems promising. If so, she will proceed with a thorough examination. Your examination will include a general evaluation to test your ability to turn, bend, and move key joints of your skeletal system through their expected range of motion. She will test your muscle strength and other aspects revealing the health of your central nervous system. Finally, your examination will include postural evaluations, static and dynamic palpation and other procedures including state of the art scans of your nervous system to reveal any neurological problems. We explain everything that we are doing in advance! On your second visit we explain what we found and how we may be able to help you. After we study your health history and correlate our examination findings, we’ll make recommendations designed to help you get and keep your health in the Report of Findings. This two-visit approach gives us time to study your case and avoids overloading you with too much information during the first visit. We will create a care plan and begin treatment during this visit. Regular visits involve a few, highly focused minutes with the doctor. With proper groundwork laid, we can quickly size up your spine and nervous system, adjust you and get you on your way. We recognize that your time is valuable and we do everything possible to run on time. Contact Canalview Chiropractic today to make an appointment!